The WindeX Chiller Units are the best solution for cold water systems on board of sea going vessels. The units are extremely reliably under the most extreme conditions. The seawater cooled condenser is designed for water temperatures from 100 C to 400C. Other temperatures are on request. With the built in water filter, flow switch, purger and pressure sensors the unit is very compact. For optimal efficiency, low noise and durability a scroll compressor is used. Due to the compact dimensions and robust construction the unit can be placed nearly anywhere. 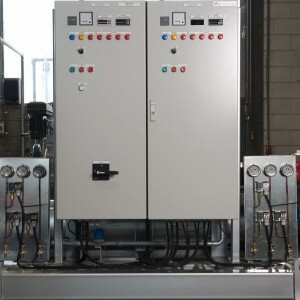 In order to install the unit only the box water or seawater system have to be connected. And the chilled water has to be connected. Pumps are required and can be calculated and delivered by WindeX. The electrical cabinet is mounted on to the frame of the unit. That way installing the unit becomes very easy. Several options are available such as remote control and MODBUS connection.